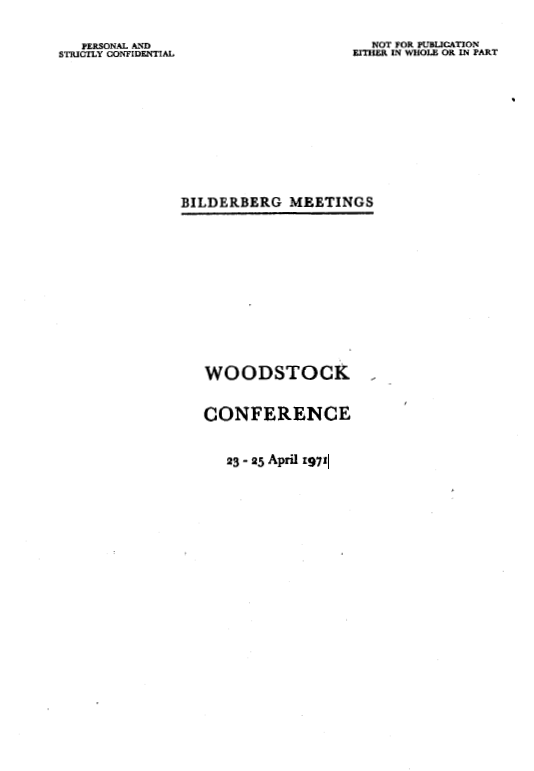 The twentieth Bilderberg Meeting was held at the Woodstock Inn, Woodstock, Vermont (United States) on 23, 24 and 25 April 1971 under the Chairmanship of H.R.H. The Prince of the Netherlands. There were 92 participants from the United States, Canada and twelve Western European countries as well as from various international organizations. They consisted of members of governments, politicians, prominent industrialists and bankers, lawyers, journalists, national and international civil servants and outstanding representatives of the academic world and other groups. In accordance with the rules adopted at each Meeting, all participants spoke in a purely personal capacity without in any way committing whatever government or organization to which they might belong. In order to enable participants to speak with the greatest possible frankness, the discussions were confidential, with no representatives of the press being admitted. The Meeting was opened by H.R.H. The Prince of the Netherlands, who expressed the gratitude of all the participants to their American hosts. His Royal Highness read telegrams which he proposed to send to President Nixon and to Governor Davis of Vermont. The Prince read a letter which he had just received from Professor John Pesmazoglou, expressing regret at not being able to attend the Conference, his request for a passport not having been granted by the Greek authorities. His Royal Highness was pleased to announce that Mr. Joseph Johnson, although retiring this year as President of the Carnegie Endowment, had agreed to continue as Honorary Secretary General for the United States of the Bilderberg Meetings. After recalling the rules of procedure, The Prince turned to the first item on the Agenda.